I rarely write posts about things I didn't make. But when I do, it's about things that are just too meaningful not to write about. #ALONETOGETHER by LaBeouf, Rönkkö & Turner is definitely one of those things. Starting April 12th, 2017, Shia LaBeouf, Nastja Säde Rönkkö and Luke Turner spend a month in three separate remote cabins somewhere in Finnish Lapland. 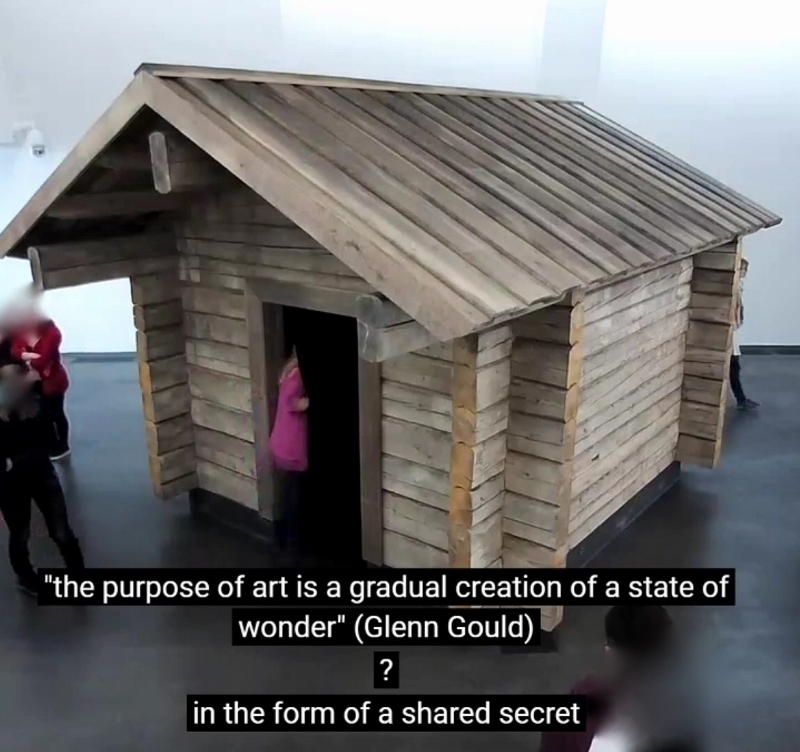 Their only connection to the outside world is through a video connection to a cabin inside the Kiasma museum of contemporary art in Helsinki. In the cabin there are three screens with live video feed from each artist, and while the artists can see and hear what happens in the cabin in Kiasma, they can only communicate through text without seeing what the other artists are typing. Even if you're not able to visit the museum, you can follow along as there's a live video of the outside of the cabin and of the written communication by the artists on Kiasma's website (the museum is closed today, so check again tomorrow). And there's also a sweet Twitter community pitching in. Sounds like a crazy chatroom, right? Yeah, it's a bit of a crazy chatroom, too, at times. But #ALONETOGETHER is also weaving a web of genuine and meaningful connections. There's a squad of regulars visiting the Kiasma cabin daily, there have been at least a couple of first dates in the cabin, there's been lots of contact info exchanged - there have been brief hellos, intense arguments, long talks about politics, deeply personal conversations, general silliness, choosing the perfect boxer entrance songs (I chose mine without thinking too much - it's Phenomena by Yeah Yeah Yeahs), reading aloud poetry (mine, too), relaxing group hypnosis, and lots of four-minute life stories and eye-to-eye staring. So, yeah, I spent a quite a lot of time (10+ hours of my life extremely well spent) in that tiny hot cabin rebreathing the breath of others during my brief visits to Helsinki these past few weeks. I'm generally not one to easily connect with people and I always worry about misreading situations. The line between brief small talk and revealing yourself in all your damaged glory is a tough one to navigate. #ALONETOGETHER is about connecting. There's no ambiguity about whether or not it's appropriate to be present and vulnerable if you so choose. The atmosphere and the dynamics inside the cabin change as the visitors inside come and go. Not once was there even a hint of hate speech when I was there, and the cabin was nothing but welcoming to me. Most of the squad of regulars is formed by teenage girls - some probably there because of Shia LaBeouf's acting career, others for other reasons. But their reasons to be there are irrelevant. Their presence and what they bring to the room is relevant. I haven't spent this much time with teenage girls since I was one, and it was a pretty cool experience at the age of 33. The girls were both adorable and super smart, and I have no doubt they will turn into amazing grown-ups. I have a feeling during the days they spend in the cabin they overhear so many life stories and learn about important life lessons this might be a huge deal for them. Their minds like sponges. And mine too. I know this experience was something pretty significant one to me now (and it was heaps of fun, too). I can only imagine how earth-shattering it would've been to me to be welcomed as a part of something like this at the age of 15. Shia, Nastja, and Luke are three very different personas. It made the #ALONETOGETHER experience all the more interesting. At one point Luke named the cabin the Finding Yourself Cabin. To me that feels pretty accurate: lots of finding oneself seemed to be taking place there. Many people came in to reflect on major (and minor) life events - past, present, or future - and often ended up gaining a new perspective or two by the end of their cabin visit. Having three artists with three distinct approaches and a changing crew of museum visitors in the Kiasma cabin means someone is bound to bring up an aspect you hadn't considered before. Don't get me wrong, the cabin isn't a therapy cabin - it's whatever you make it. But you'll get the most out of it if you let yourself be open to having whatever conversation that may arise. I admire how the artist trio manages to continuously challenge new people to be present, to take part, to maybe share something quite personal, to see themselves and the world in a slightly new light. There's a certain magic in feeling connected. And this piece wouldn't be as powerful as it is if it weren't for the visitors willing to take that leap and say hello to the camera. 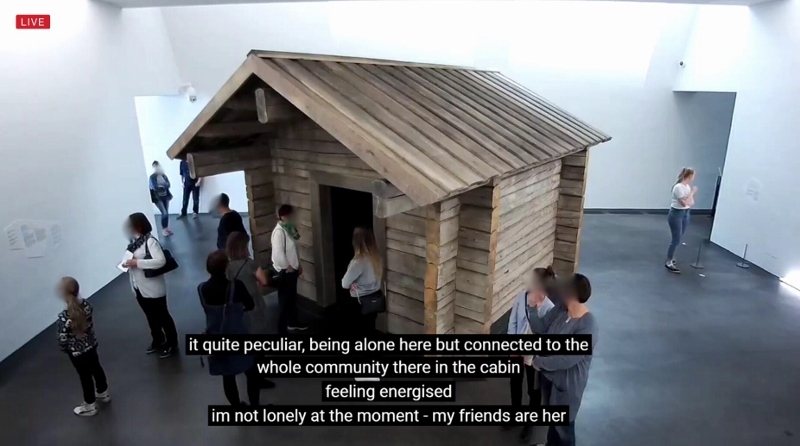 Until Friday the 12th of May you too can visit the cabin in Kiasma or follow the live web stream. I highly recommend both. It can even change your life, at least a bit. If you do go to the cabin, please say a huge hello from Kaija and play the song Just Dancing by Sylvan Esso on your phone. I'm sure Shia at least will appreciate it. The images in this post are from screenshots of the live stream. See how skillfully I've blurred people's faces? I didn't take a single selfie inside the cabin. I know I was there and that's enough. And the other photos I have of the things that went on in the cabin are just for me. But if you want a peek of the cabin and myself, take a look at this story. I was visiting the cabin with V and got ambushed by a journalist. "More and more I excluded from my paintings all curved lines, until finally my compositions consisted only of vertical and horizontal lines"
We were really lucky to have several great exhibitions coinciding with our honeymoon (okay, so we planned the trip first to coincide with the Cornell exhibition, before V proposed, and before we decided to get married before the already planned trip, so we could have all these great things happening on our honeymoon). I actually have a long history as an admirer of Agnes Martin, which is a bit random because her work isn't very well known in Finland and I got acquainted with her art back in upper secondary school/high school/the Finnish equivalent when Internet was used mainly for school work and irc, and less so for viewing interesting art. The local library had a copy of Hiljaisuus taloni lattialla (links to a review in Finnish), a book of translated essays and art by Agnes Martin, and that book was possibly the prettiest book I'd held in my hands by that time. I can't remember much about the book, other than it was aesthetically most pleasing, though I must have read it a lot, since I remember having it on loan for really long periods of time. After moving away I haven't even thought about the book until this spring when the news of Agnes Martin's exhibition at Tate Modern reached me. All these years Agnes Martin was one of those artists whose name I couldn't remember (just like most other artists; I'm useless with names), and whose work I tried describing to people in hopes of someone recognising the artist and being as thrilled about her as I was. 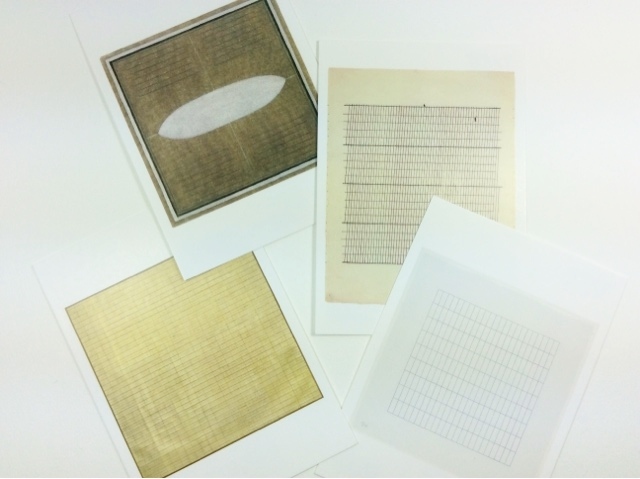 I was a bit worried beforehand that the exhibition might be boring (if not for me, for V at least), since Agnes Martin mainly painted and drew stripes and grids, and a lifetime's worth of stripes and grids can be a bit of a daunting thought. It turned out I was concerned for no reason at all and we both enjoyed it heaps. Repetition ≠ boring, repetition, more often = meditation. There's actually a quote on the exhibition leaflet from critic Lucy Lippard describing Martin's work: "legendary examples of and unrepetitive use of a repetitive medium", and I think she really hit the nail on the head there. Most paintings on display at the Tate are 72" (183cm) squares, the ones painted later in life - when Martin had become older and more fragile - 60" (152cm) squares, which I can imagine being very much easier to handle, but there are some small drawings on paper there, too. I liked how the repetition spreads from the canvas to the size of canvases, it was a lovely constant to have Viewing the exhibition was a very different experience from any other exhibition I've seen; I just went into this strange mode where you suddenly have a connection with all these grids and stripes, and grids are suddenly the best thing in life. So, yeah, I definitely prefer grids to stripes, and I found out I have a favourite type of grid, too. The postcard at the bottom right corner in the above photo features a nice grid, but I'd prefer it sideways. Horizontal rectangles with very thin lines, approx. 1:2,5 - that's the perfect grid to me. One painting really stood out, most obviously because of its uniqueness and materials. Friendship (incised gold leaf and gesso on canvas, 1963) has a gorgeous dim glow about it (and a great grid pattern) in real life; the above photo nor the postcard in the photo do it no justice at all. No surprise, I'm a big fan of gold leaf - it's just wonderful to have a material that seems to illuminate itself from within. Well, that's how it works at its best, when the gold leaf is not polished to a perfect mirror finish but has some character. Naturally I'm terribly interested in the creative processes of other artists, and Agnes Martin's was really relatable to me. Agnes Martin had schizophrenia, so maybe the lines were a way of bringing order into her world, maybe they were something totally unrelated to her mental status. I'm not really all that interested in her personal history, it's sort of irrelevant, but I personally find my Aspergers has something a lot to do with the way I create and view art (and how could anyone's personality not affect the things that, basically, form the core of their personality... I just stepped into a weird vortex. Let's just forget it and continue, okay?). I find the thought of drawing hundreds and maybe thousands of lines with a ruler comforting as well as meaningful. I, too, think it odd to feel there's meaning in straight pencil lines, but why not? I'm not always quite right in the head, either. I just find it interesting that someone spent decades perfecting their spectacularly straight lines and created so wonderfully beautiful artworks in the process. "My paintings have neither objects nor space nor time nor anything - no forms. They are light, lightness, about merging, about formlessness, breaking down form." The Agnes Martin exhibition at Tate Modern is still open until October 11th. Do go and let me know what's your favourite type of grid (or stripe)! 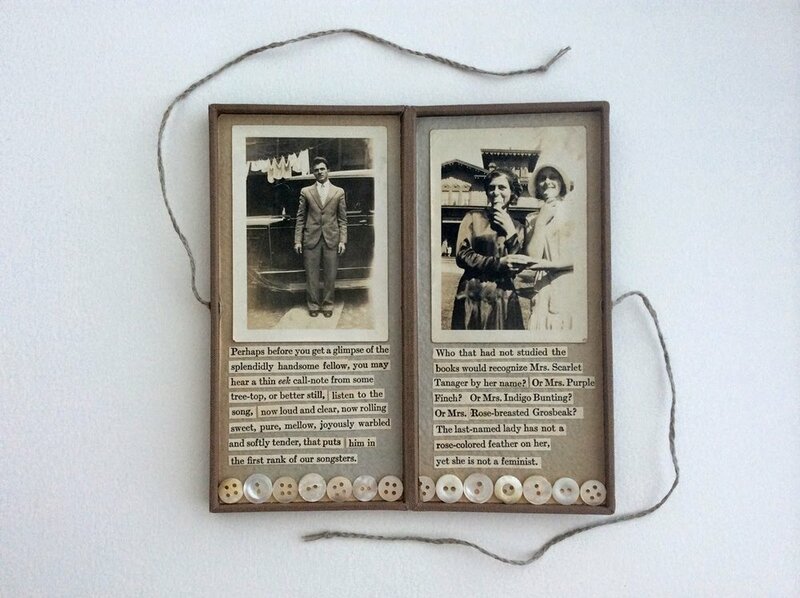 Joseph Cornell's Wanderlust - Final Days! Apparently wedding planning, having a wedding and going to honeymoon made me abandon my blog for a good while, but let's not dwell on it. I'll tell you more about everything later, but first things first: Joseph Cornell's fabulous Wanderlust exhibition at London's Royal Academy of Arts is coming to an end on Sunday. If you're in the neighbourhood or even in the UK, you must go! This exhibition was obviously the highlight of our honeymoon to me, and I do believe V was pretty impressed, too (and he's quite picky). It may come as a surprise, but I wasn't terribly familiar with Cornell's work before this exhibition. I've had people mention Cornell numerous times when they've seen my matchboxes and mixed media work, and I've naturally googled his work a few times and run into it on Pinterest, but I haven't really studied it - maybe I've feared finding too much common ground and feeling like an unoriginal idiot who simply repeats things done a million times better over half a century ago. That's pretty much how I roll; I avoid reading poems, too, worrying about being too easily influenced by the work of others. And of course, there are so very many similarities between my work and Cornell's, but, honestly, there are few mixed media artists creating boxes who can say there's no connection between their work and Cornell's. Going through the exhibition I kept realising, more and more, that the connection is not on a material level, after all, but on the intellectual level. We share a way of thinking, of seeing the world around us, of finding that world in our tattered old hoards of raw material, as well as the need to tell stories (and the key element of all good stories is often familiarity/timelessness), and it's only natural mixed media artists end up playing together in the same neighbourhood. Let me tell you, there were some freakish moments of recognition there. We left Royal Academy in a strangest state of mind that was a combination of excitement, dizziness and confusion, but we had a stack of postcards, a Wanderlust paperback and a copy of Dime-Store Alchemy to help us come to terms with wishing to go back to the exhibition the moment we stepped out. size closed 8x16,5x1,8cm / 3.1"x6.5"x0.7"
size open 16,1x16,5x0,9cm / 6.3"x6.5"x0.4"